"This is one of Grandma Bev's recipes. She always had this waiting for my mother when we visited." Mix 1 cup flour and confectioners' sugar together in a bowl; cut butter into flour mixture using a pastry cutter or two forks until mixture is crumbly. Press flour-butter mixture into an 8-inch square pan. Bake crust in the preheated oven until golden brown, 15 to 20 minutes. Mix white sugar, 1/4 cup flour, baking powder, and nutmeg into the beaten eggs. Fold rhubarb into egg mixture; pour rhubarb filling into the baked crust. Bake in the preheated oven until filling is bubbling, 35 minutes. If using frozen rhubarb, add an extra tablespoon of flour to the filling. OMG! This is my new favorite way to make rhubarb! Loved it and ate too much! I did it exactly as directed. 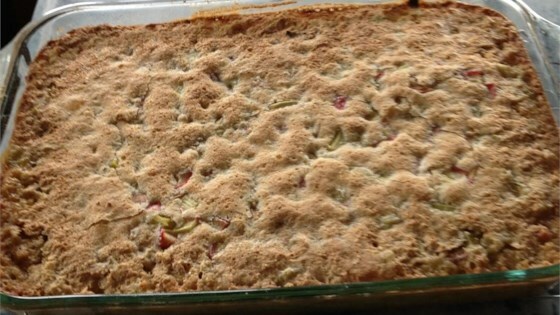 Similar to lemon bars but rhubarb. I won't make this again. Too sweet and it never did firm up. I baked it 55 minutes. A runny mess! The taste is very good, I added a handful of quick oats along with 1/4 tea. of nutmeg to the crust when mixing. Served with a scoop of vanilla ice cream on top. Baked in 11 x 8 pan.